Roll size - 1 3/8" x 2 1/8"
Standard refill bags for Bags on Board® dispensers. Also fits in pocket or purse, in Outward Hound® leash bags, or can be used as is. * .50 donated with each purchase over $7. More: Bags on Board dog poop bags are the best dog waste bags on a mini roll. Bagsonboard dog poop bags are often imitated. They are dog waste bags dispensed via a small plastic dispenser that distributes the dog poop bags one at a time through a centrally located opening in the canister. The Bags on Board canister and refills are manufactured by Tame products. The Bags on Board dog poop bag refills have 15 bags in each roll. Gotunnel / doortosummer offers several of the Tame products at a discount and also bulk price. The Bags on Board Dog waste Bags are better than their imitations and are cheaper than them as well. The Bags on Board dog poop bags can be purchased in bulk (case(s)) or individual refill size with 4 dog waste bag rolls in each pack. The discount price can be improved when you buy the 6 refill pack special and get free shipping. Bags-on-board canisters are sold as is but can also be customized with a custom label. The dog waste bag mini rolls can also be customized and sold with your label as a seal. 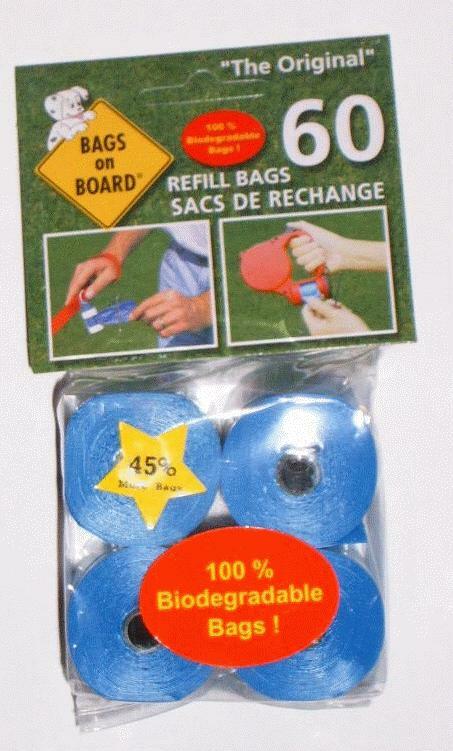 BagsonBoard dog poop bag dispensers modified with your custom label can be distributed at dog shows, picnics and other dog events. Bags on Board dog oop bags are dispensed one at a time via a centrally located opening in the canister are easily torn off, providing the dog owner with a good quality dog waste bag that opens and expands to more than twice the unrolled size of the dog poop bag. At 15 bags to each roll and 4 rolls to a pack there is a total of 60 dog waste bags in each refill pack. Gotunnel / doortosummer also offers other dog and pet products including dog agility course tracking software and dog agility equipment such as soft crates and sandbag equipment anchors and also pet publications via our associated websites. Product sales support the maintenance of our free dog friendly listings which include our off-leash dog park and beach listings as well as listings of pet friendly hotels and special places. Gotunnel is dedicated to dog sports and publishes links to popular dog sports sites. Product sales also support dog rescue and a portion of every sale is directed to that endeavor.